Na Nach Nachma Nachman Meuman: B"H Thank God for Nanach! 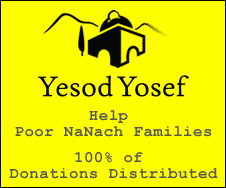 B"H Thank God for Nanach! Today I was invited to a very short interview on Israeli National TV, Channel 10, they found it incredulous that I came by hitch hiking, B"H! B"H one of our old nanach.net magnets came in handy and I put it on their fridge (the one that the staff uses)! There were some other good moments B"H hopefully you'll see the clip (I don't know when it will be aired).